What a clever idea for a book and a great message for kids. Love the idea of a school having jitters -- just like the kids. 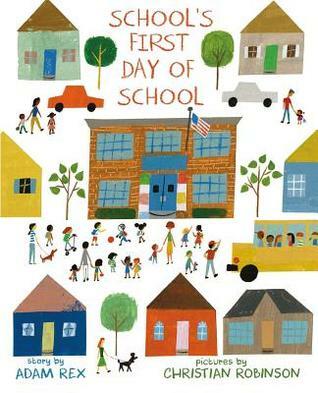 It's fun to imagine the school feeling first day jitters right along with the kids. Thanks for sharing! I love that this book is writtenn from the perspective of the school. Instantly, the title makes me want to read the book to get into the heart of this inanimate object. The story seems to beg the question: If walls could talk, what would they say? Childrne will love your activities. I especially like the idea of interviewing the janitor. I think kids (and adults) will be amazed at how much janitors do. Thanks for a great book review. So many opposite takes in today's PPBF choices/ Different perspectives can be so helpful. Christian Robinson is one of my favorite illustrators. Nobody considers what the school thinks about Back-to-School! What a fun way to approach the subject.